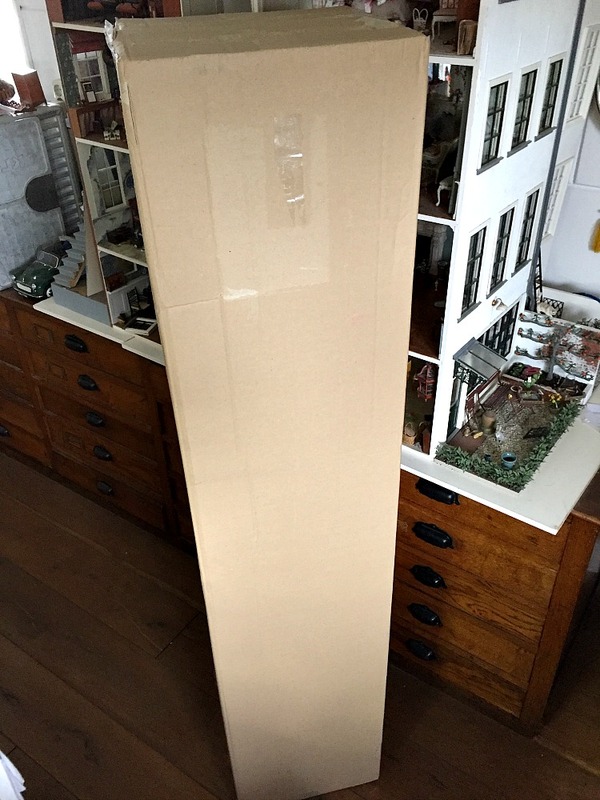 Look at the size of this box! A person would fit in there easily. Hmm, cheap holiday??? Back to the box...it contained a rolled up sheet of very thin plywood. I used to get it from another supplier who sold smaller pieces, but the shop has closed so now I have to buy whole sheets. Here's another photo from a few years ago. I know some of the packages contained wood, and the square one I think had my bandsaw in it, but I can't remember what else was in there. All related to miniature making though. The problem for me when buying these supplies is getting them down to the size I need them. Most of my shop tools are for miniature making. Another problem is space. I don't have the room or the machines cut a 150 x 150 cm sheet of plywood. My initial cutting up of supplies is very crude and requires quite a bit of creative thinking. Over the years I have acquired a nice collection of tools for my workshop. But with all the cutting, sanding, drilling, routing etc. that goes on in my workshop, I create a lot of dust. Not good for my miniatures (which are in the same room) and certainly not good for me either! So, after nearly killing my regular vacuum cleaner, I finally invested in a shop vac. I bought the Record Power DX1000 and wow, what a difference that makes! Even the thickness sander, a machine I only ever used outside because of the incredible mess it makes, can now live in my shop and be used regularly without problems. The shop vac comes with a huge hose, far too big for my workshop machines. Online I did see rubber attachment pieces which stepped down to the size of my regular vacuum hose, but the prices with shipping were rather steep. I worked out a simple solution: I cut a piece off the existing hose to be able to attach it to the shop vac. I then cut a circle of plywood the size of the hose, cut another circle in the middle the size of my vacuum cleaner hose and glued that inside the big hose with a two part adhesive to create a seal. It doesn't look pretty but it works! I would recommend anyone using machines in their workshop to buy a shop vac. I should have done this years ago. It does make a bit of noise (I must say I am somewhat sensitive to noise), but I wear my ear defenders when I use my machines anyway so it's not a problem. Even though the shop vac eliminates a lot of dust, I have opted for another way to improve air quality in my workshop. So about a month later, with a little pressure from my loved ones who said one can never be too careful when it comes to health, I also bought the Record Power AC400 Air Cleaner. This remote controlled device filters airborne particles up to 1 micron. It runs fairly quietly in the background and as an unexpected bonus distributes the hot air from my heater around the room. The effects of this machine are less obvious than those of the shop vac, but when the sun hits my workshop, there are no more dust particles dancing in the sun. Not all my supplies are so big they create a problem trying to use them or store them. Just look at this glass I was given. 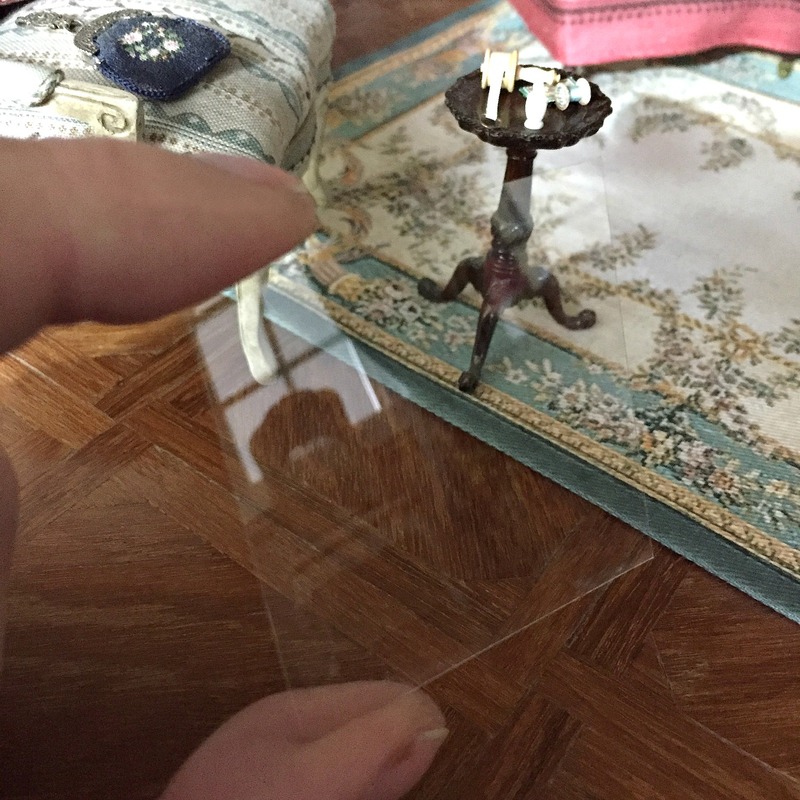 It is the thinnest glass I have ever seen. It is only 0.15mm thick! (See the photo with the callipers below). Isn't that incredible? I had no idea glass this thin existed. And given its thickness it is still fairly strong. I don't know what I'll be making with this yet, but given that the box of glass is small I won't have a problem storing it until I need it. I leave you with this gravity defying photo of a room I have been working on. It is a drying attic, a room at the top of a house where all the washing was dried and ironed. More on this room in my next post! Ik heb net een werkbureau in elkaar gezet voor de "hondenkamer" die ik nu ook als hobbykamer ga gebruiken. Ik zie dat ik nu al ruimte te kort ga komen. Ik ben benieuwd naar jouw linnenkamer. Nooit genoeg ruimte Huibrecht. Mijn werkkamer is vrij groot, toch ben ik steeds aan het schuiven en herindelen om voor alles een plek te vinden. Maar ik ben me zeker bewust dat ik bevoorrecht ben met mijn werkruimte. Waar moeten je honden nu slapen? Maak je over die twee maar geen zorgen. Zo wreed ben ik niet. Ze eten alleen in die kamer en slapen in de woonkamer. Alleen Pietje sliep hier nog. Dus was het een mooi moment om de manden op te ruimen. 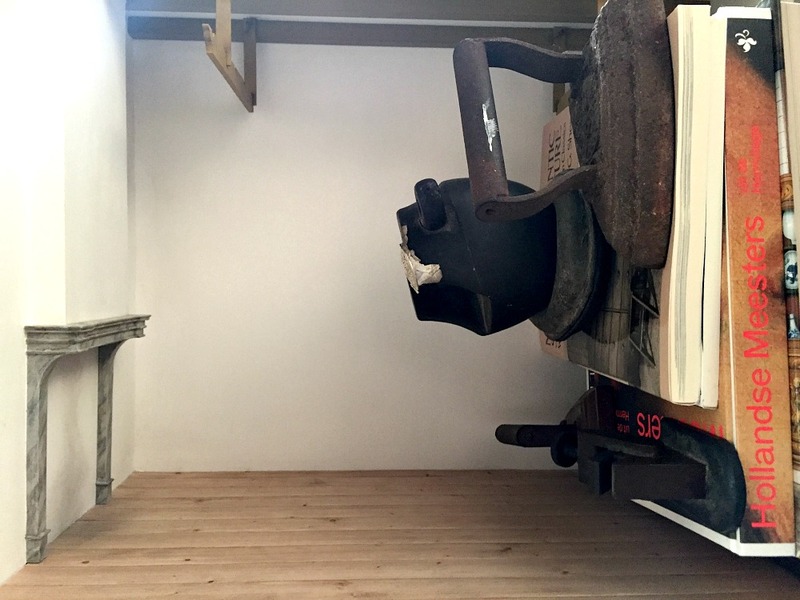 What a clever idea for cleaning your workshop from dust. I have the same problem so I would very much like to hear where you bought both cleaners. By the way - I love your blog. Thank you Farmor. 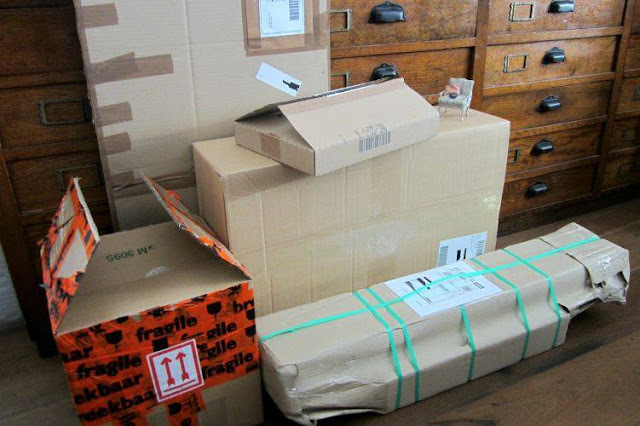 I bought both machines from Baptist, a shop for woodworkers in Arnhem, the Netherlands. https://www.baptist.nl If that is too far for you, just google the brand name Record Power for a dealer near you. Hope that's any help! Librarse del polvo es es muy importante. Yes it is Isabel. I have always been quite good wearing masks etc. but the dust still lingers in the air. So this is much better. Very clever solution! And good idea with the Air Cleaner. I should think about something similar. Yes please do Sheila. I think it is worth the investment. Hi Josje, Hopefully you are seeing signs of Spring around the corner. It is such a pleasure to receive parcels in the mail. Even though we are expecting the contents (as we have ordered and paid for them) it still gives a fissure of excitement to unwrap a parcel. I also dispair sometimes about the unnecessary bulk of the wrapping. However if our minis were wrapped mini size they would certainly disappear between the cracks! It was nice to see your house hiding behind the parcel for the wood veneer! Your family is correct in supporting your filtering dust out of your workroom. 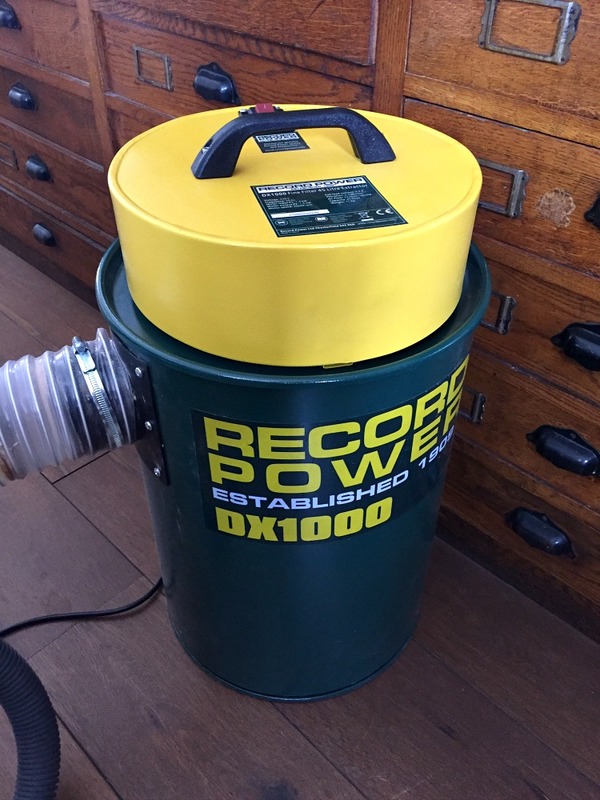 Presently Bruce is working with yellow cedar and he has all the dust extractors in the garage working overtime. He is rebuilding our “squatters” chair from Australia that we have had for many years. Regards and look forward to your next post - possibly revealing what is behind the clamps? Hi Janine, You are so right about the excitement of unwrapping a parcel. I suppose it is because we have to wait for it to arrive when it is sent by mail. My house is in a state of disarray at the moment. I was trying to finish it before it's 15th anniversary last February. I failed ;-) but I am close. I'm sure sometime this year we will see its completion. I had to look up the squatters chair, I never heard of it before. But what a wonderful chair for relaxing on the porch or in the garden! I love the extending leg rest. Hopefully spring will come soon in your part of the world too and you'll be able to use the chair. Re the Squatters Chair. These were used primarily by people on the land. The men would come home from the wherever on the property have their midday meal and then settle in the chair for an after lunch snooze. They could put their feet up and not even take their boots off! I remember visiting a very big property (thousands of acres) and they had about ten squatters chairs on a wide verandah. I always wanted one and it is a great spot to settle to read with its built-in foot rest. I planted about 300 tete-te-tete daffodils in September and now they are all up nodding their heads like little rays of sunshine. I took from 1991 till 2015 to finish the French House so I do understand your pressure on yourself to finish the Canal House. I look forward to seeing an overall picture on completion. The squatters chair could be popular her too with all the potato farmers around. Great if they don't have to take of their muddy gear when taking lunch. Maybe our weather isn't as nice though. 300 tête-à-tête daffodils! What a glorious sight that must be! I have a few clumps of them dotted around my back garden like little clusters of happiness. They were all planted after they had first served as flowers for the table, with the bulbs left on obviously (there is a pot of them on my workbench at this moment). The dust particles which I find the most difficult to contend with are those from gyp-roc or plaster, which seem to stick to everything and leave a film even after several passes with the vacuum. Your modifications on your new Shop Vac sound very efficient and effective as does your new air cleaner. Your family is Right, maintaining your best health is paramount. And I have never seen such wafer-thin glass either but is it like microscope glass? and any ideas brewing, as to how you might use it? Yes I agree. I usually follow up with a damp cloth for the plaster dust, but it gets into everything! 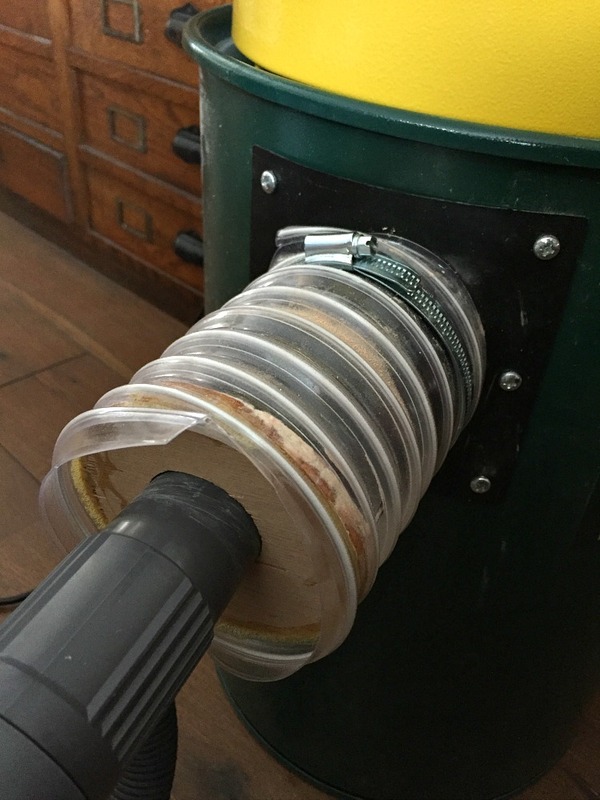 It does help to turn the vacuum on while sanding, keeping the hose close by somewhere. I suppose the glass is some sort of microscope glass, I really don't know. As for how I will use it, I don't know that yet either. Maybe for framing art (covering embroidery will keep it nice and thin) or as a glass lid for small boxes...It will be used eventually, not sure how and for what yet. Neither can I Blanche :-) But this room isn't part of my house, it is a separate roombox. You'll see it soon. Those are very nice upgrades to your workshop. I do recommend adding one more thing to the vacuum. Do a search on Cyclone dust collector. You can purchase a small plastic unit from Ebay that you fit onto the top of a bucket. What it does is drop almost all of the debris into the bucket before it reaches the vacuum cleaner. This means your vacuum cleaner filter does not get clogged and that means you don't loose suction power and you don't have to clean it but once a year or so. This is a very big improvement as cleaning filters creates a lot of dust and mess. Thank you for the tip Karin. I'll see if I can get one. I watched a video of someone emptying the vac and cleaning the filters...it seemed like it was defeating the purpose as there was so much dust coming from it. I had already decided that cleaning the filters would be a job best done outside. Very nice dust collection system! The glass is wonderfully thin. And good to not want to breathe dust. I am lazy and have a bad problem now that I'm reasonably sure was caused from breathing dust for a zillion years....My shop vac is very powerful and was a cast off from the bar, when I was cleaning there, got to take stuff home no longer wanted. 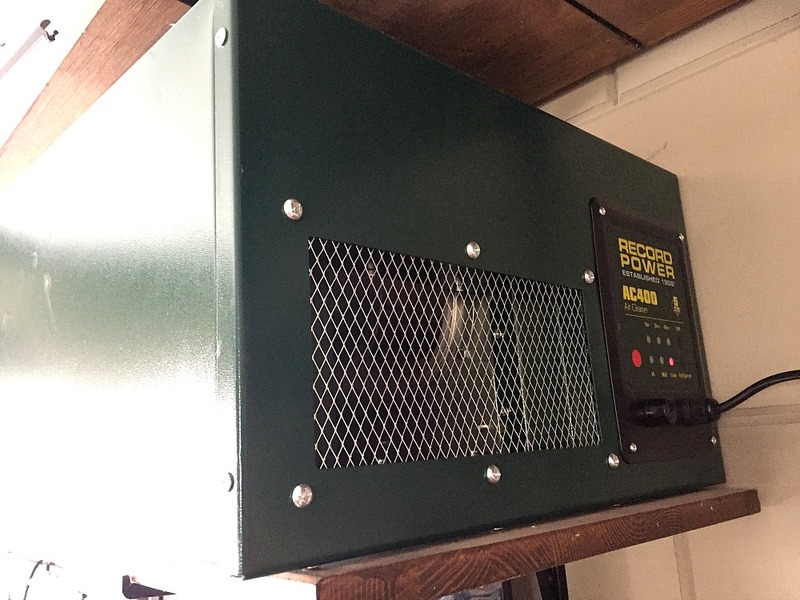 I have box-fulls of stuff to improvise vac connections, like the lids from laundry soap etc...I also made a nice air cleaner that runs though 4 furnace filters and a squirrel cage motor. And I made the collector Karin is talking about out of a 5 gallon bucket. Improvising is half the fun! You're more technically savvy than I am Linda! (And so is Karin). It is wonderful you can make all of these things yourself. Very clever! I am really in awe of all your tools and equipment. 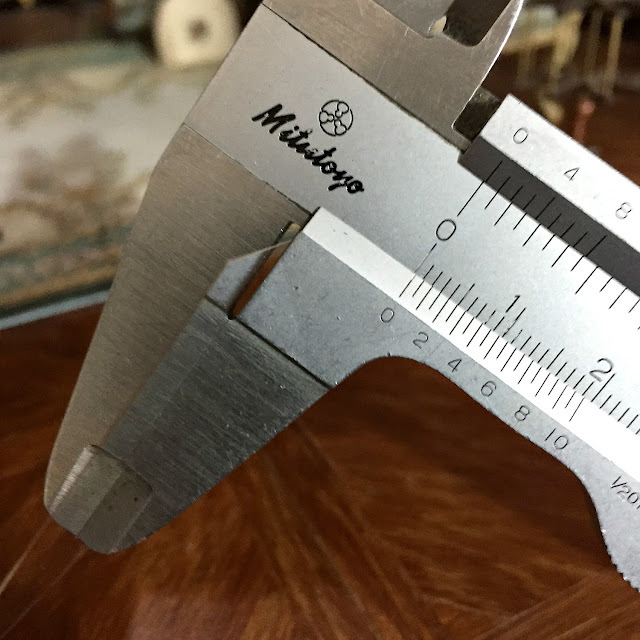 I have never invested in good miniature tools but definitely plan on doing so in future. I cannot wait to see the drying room. Thank you Giac. You're doing a great job without all of those tools anyway. But I must say, when you get a really good tool, it makes the job so much easier. In Dutch we have a saying which translates to 'good tools are half the job'.